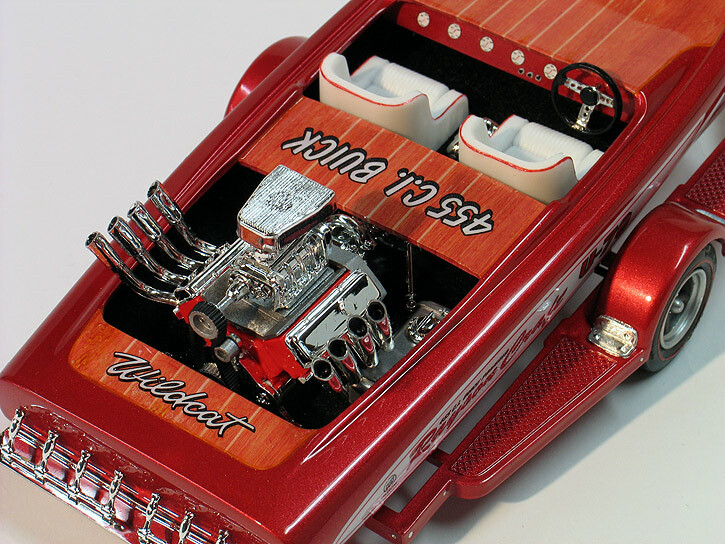 Number 5 in my series of '70 Buick Wildcat builds is this phantom pickup. 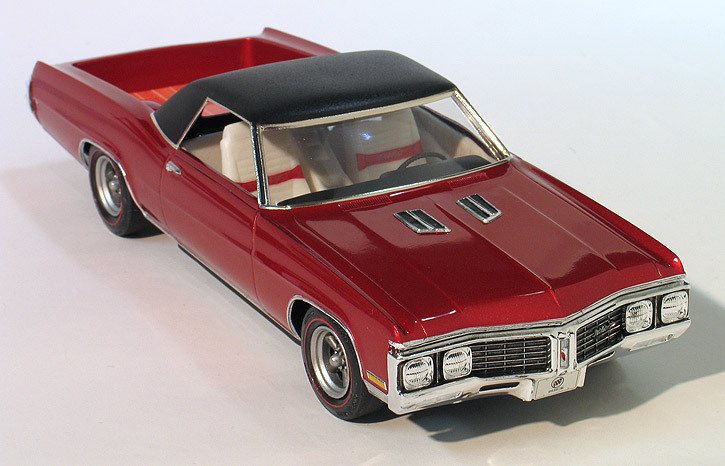 I got the idea to build the Wildcat as a pickup while I was digging through the Model King / MPC '70 Pontiac Bonneville kit. The Bonneville is a convertible and I was planning to rob that kit for some parts to make a convertible Wildcat. 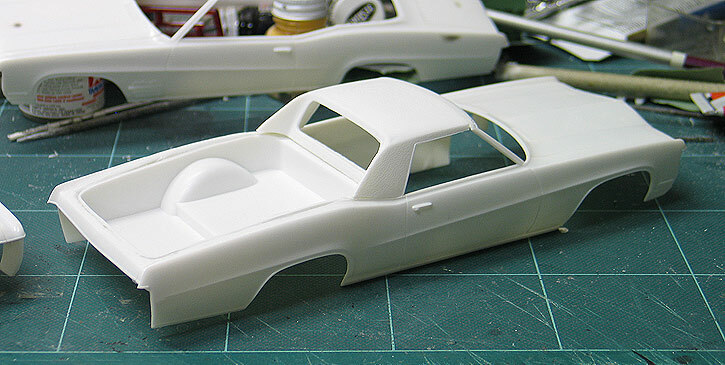 While looking through the Bonneville I noticed the optional pickup bed parts in that kit and thought they might fit the Buick. A little eyeball engineering and I realized they could work - and the idea for this project was born. Sometimes for my models I like to create a back story to give them a context. For this project I imagined GM building an El-camino style Buick pickup show car for the 1970 auto show circuit. Back then auto makers often built custom cars based on production models to draw attention to a new model. 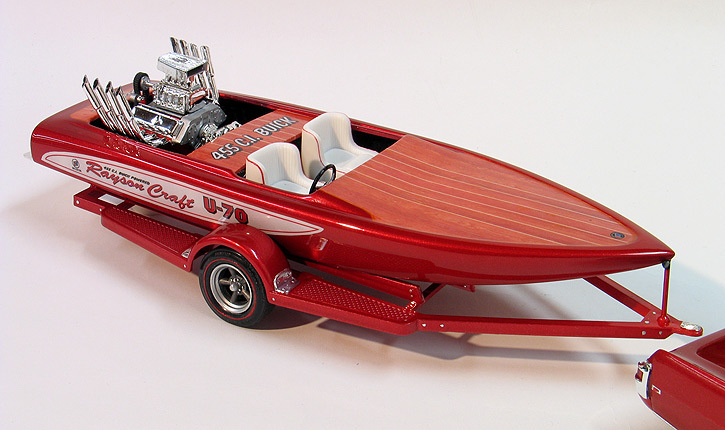 Since the Bonneville kit came with a Rayson Craft speed boat and trailer I thought it would also be cool if my show car was pulling a matching Buick powered speed boat. To create the pickup I first took some measurements of the Bonneville's pickup parts and then transferred them to the Wildcat. The Pontiac's interior and pickup bed is molded as one piece so I cut them apart just behind the seats. I decided to keep the Buick's windshield since it was already the proper width. 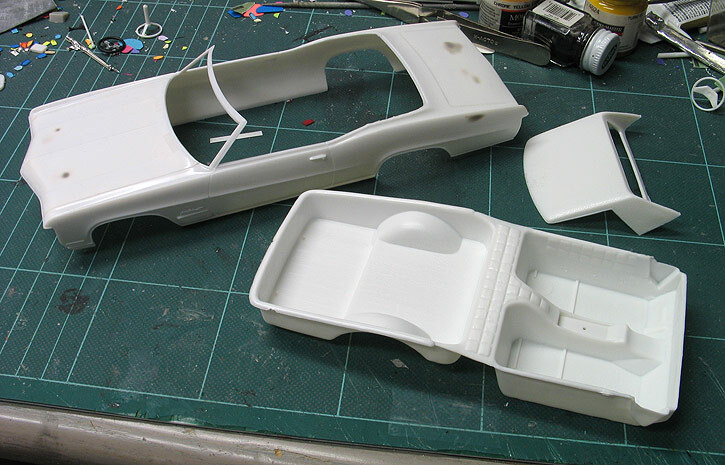 I cut out the roof just behind the windshield on the Buick and then cut away the trunk area as well. Then I glued the new roof and pickup bed in place. The roof piece was a little too narrow so I built up some material using bondo along the upper part of the side windows to get the proper width. 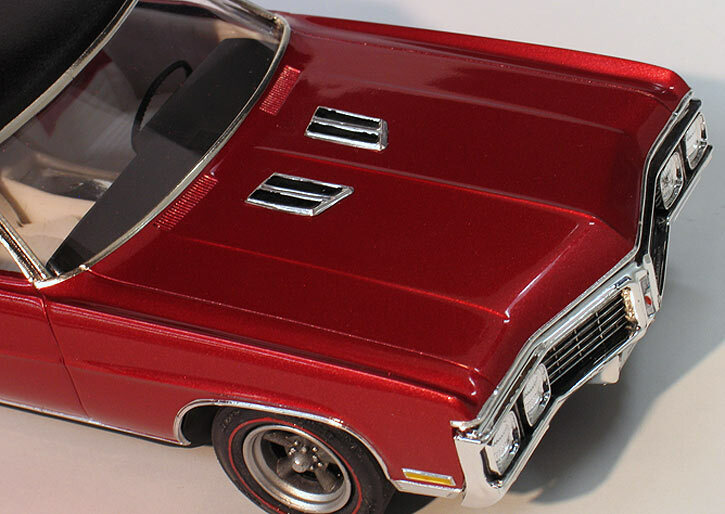 Actually, the Pontiac parts fit the contours of the Buick very well which is not too surprising seeing as how the basic understructure of the real cars is similar. The top features a kick up at the base of the roof which nicely matches the sweep of the body lines just aft of the doors. I did make one change to the roof though. The entire Pontiac roof features a slant forward toward the windshield. I did a lot of grinding and sanding along the rear of the roof in order to level out the top. In my back story I imagined Buick borrowing another styling trick from the Chevy playbook and creating hood vents similar to those found on 60's Super Sport models. To keep the styling correct for a Buick though I moved the chrome vents from the bottom of the front fenders to the top of the hood. To accomplish this trick I made an impression of the vents using aluminum foil. Then I filled the back side cavity with 5 minute epoxy. After the epoxy hardened, I trimmed out the shapes and had myself a pair of chrome vents for the hood. I then carefully sanded off the molded-in vents from the fenders. While I was at it I also removed all the molded in emblems for a smoother custom look. For the interior I used the custom 2 seat interior from the Pontiac and modified it to accept the dash and front buckets from the Buick. I kept the detailing pretty simple on the interior and just added Detail Master dark red flocking for the floor after painting. 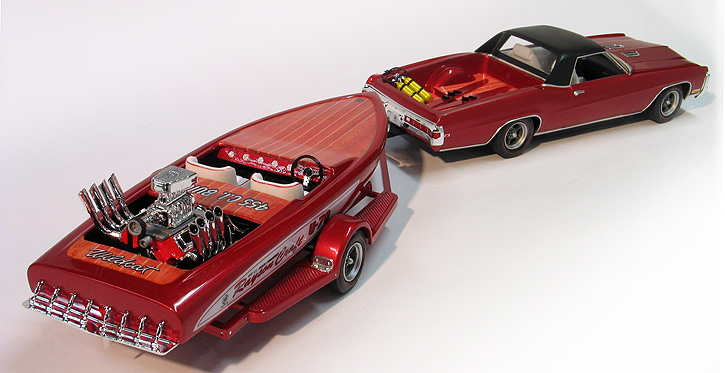 I wanted the car, trailer and boat to have a period correct 1970 look. For color I painted them with Tamiya metallic red. After the decals were applied everything was shot with a urethane clear and then finally the top of the Buick was sprayed with a textured semi-gloss black to represent a vinyl top. The wheels are the optional Torque Thrust wheels found in the ancient AMT '68 Shelby GT500 kit. Using these wheels necessitated buying a second Shelby kit so I could get a matching set of wheels for the trailer but I thought it was worth it. The plating was stripped of these wheels and they were painted with various shades of Testors Metalizers to make them appear more realistic. The tires came from two Buick kits. I painted the redlines by hand. 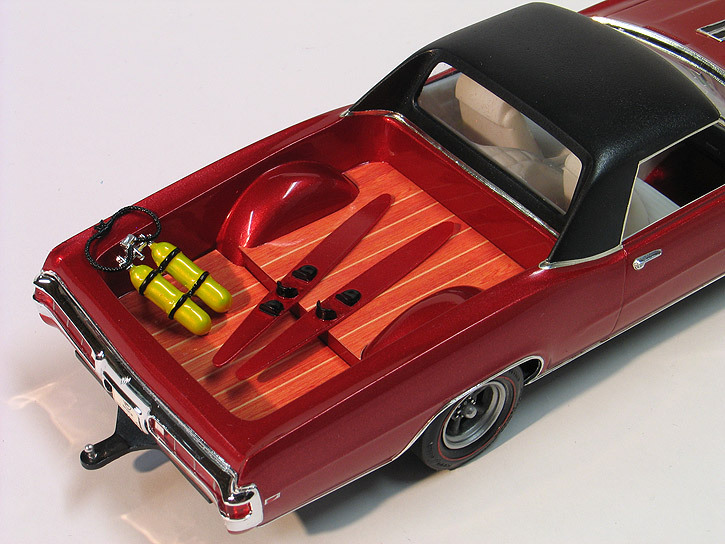 The Pontiac kit also provided the scuba tank and vintage water skis which I used to dress up the bed. 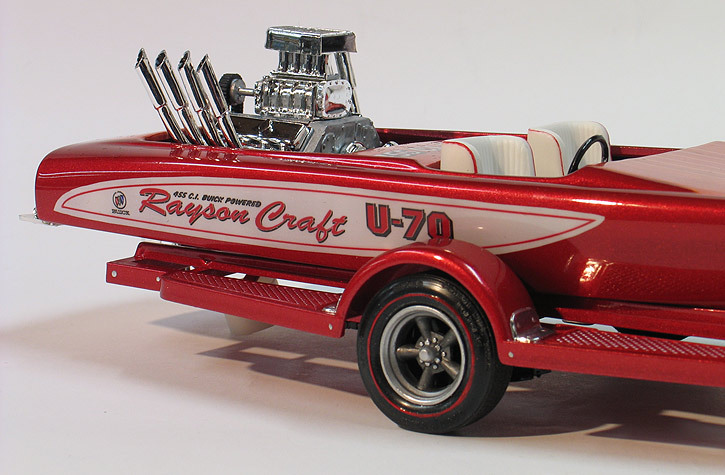 The Rayson Craft drag boat and trailer were pretty much built right out of the Pontiac's box. One small change though was adding a different set of valve covers to the engine to make it look a little more like a 455 ci Buick motor. For the boat I did want to do something a little special. 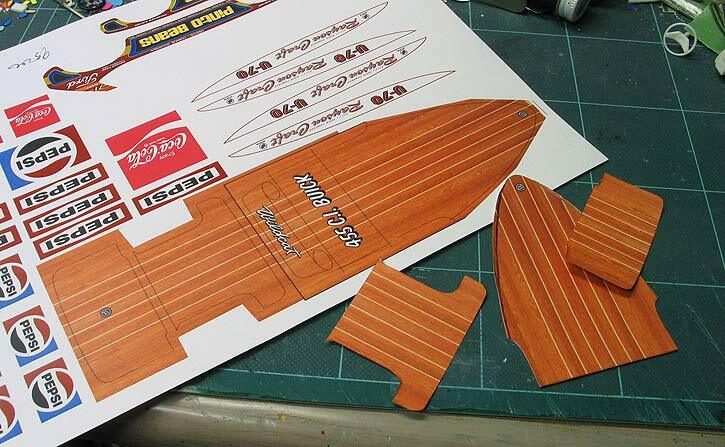 It comes molded with a wood deck and after some thought I decided to make a set of custom decals for the wood decking rather than trying to paint it. This became one of the most time consuming challenges with the entire project. First, I created some paper templates from the model and then scanned them into my computer. Next, I did a Google image search for photos of wood patterns and turned up some nice high resolution pics of wood flooring samples. I drug these into Photoshop and manipulated them into the right scale, color and shape that I wanted. I also created a matching wood deck floor for the Buick's pick up bed. 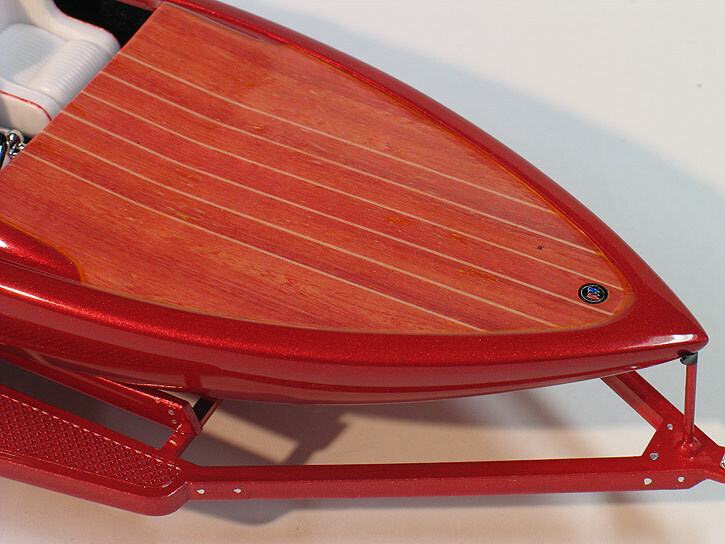 I created the side panel art for the boat at the same time. 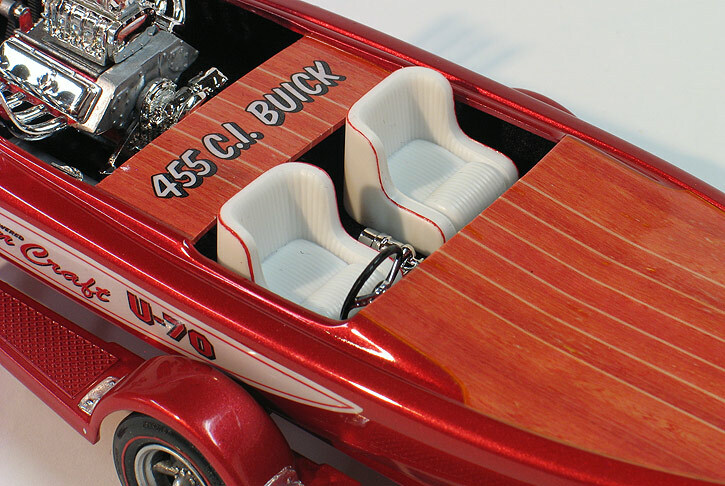 It's not a replica of any particular boat but it's in the spirit of other drag boats I've seen from that era. This whole process took quite a while as there was a lot of back and forth trying to get the shapes to fit right before printing a final set of decals. Finally, after I had a fit I was happy with I printed the decals on a high quality ink jet printer using white decal paper from Bare Metal Co. 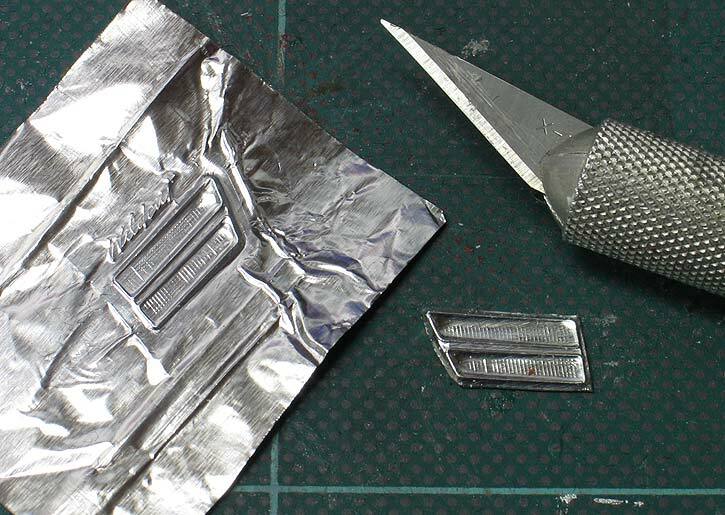 The decals were then coated with a couple coats of Tamiya clear to waterproof them before applying them to the model. I hadn't used this decal paper before and because the surface area of the decal was so big it was very delicate and tricky to work with. But with patience it ended up working fine. Now that this project is completed I can get back to my original intent and build that Wildcat convertible. See other model cars I've built.